We have been talking about the qualities of a good friend in Lunch Bunch for the past two weeks and I wanted to be able to review what we learned that was fun before moving on to another topic. 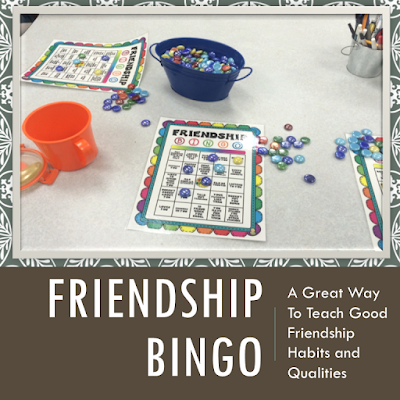 As a result I made this Friendship BINGO game. My kids love playing BINGO so I knew they would enjoy this. When they came in, I asked them to each tell me one good Friendship Habit. Many of the answers I received were: respects what I have to say, cares about me, understands that I may other friends, tries to work out problems, etc. We also talked about what qualities made a good friend--they're caring, loving, nice, happy, trustworthy, respectful, a good listener, etc. When we were done talking, they each took a board and some small colored floral stones to use as markers. Here are a few pictures of them getting ready to play. Is your sale still going on for this game on tpt?